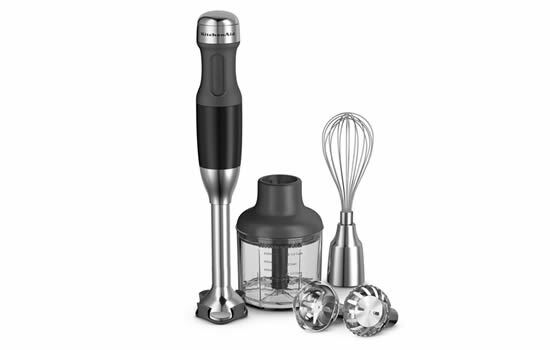 A hand held blender (also called immersion or wand) is a versatile and easy-to-use kitchen gadget that is certain to offer a variety of benefits to the home-chef. A multifunctional handheld blender is compact in size and able to replace the large countertop appliance in several situations. A regular function for the handheld blender is sauces and soups. For a creamy, rich soup based on root vegetables, these blenders can quickly achieve the desired consistency. A hand held blender is easy to place right inside a cooking pot to make the entire pulverizing process quick and easy. These blenders are great at turning garlic, onions, roasted tomatoes, or herbs into a thick sauce for a pizza or pasta. A dressing in need of emulsification like mayonnaise can also benefit from these appliances. Hand held blenders are well-suited to making a milkshake or smoothie and can be easily made without using a countertop model and having to clean up after use. A small job like preparing hummus, salsa, pesto, or home-made baby food is easily achieved with the immersion blenders. Add on a whip accessory to make the appliance even more versatile. This makes it possible to easily work with muffin batter, pancake batter, or eggs. Also, a more powerful model can even create shaved ice. A hand held blender is easy-to-operate, lightweight, and quiet. A great advantage of using these blenders is the convenience and size. The compact size of the blender makes them a practical choice to use in either cocktail shakes or pots. The simple design and compact size make it easy to clean and this is achieved by washing under hot, soapy water. A blender model with detachable shaft is even easier to clean and doesn’t risk damage to the motor. Even though the handheld blender is designed to be lighter than the countertop models, some of the larger units can be uncomfortable and heavy to use after a period of time. For safe operation, these portable blenders rely on the power button being held down continuously while in use. This process can be quite tiring on the more sizable models and result in hand fatigue. Also, the blenders with a blade guard in place can make it more difficult to effectively clean. A hand held blender near the budget-end of the market offers one or two speeds and minimal, if any attachments. A high-performance model is more feature equipped and includes more efficient power, add-on accessories, variable speeds (high and low is usually sufficient), and comfortable grip. Any well-equipped handheld blender should be available to buy for less than $100, while the most basic models can be found starting at $10. Immersion blenders come as cordless or cored versions and built with a removable or fixed shaft (stainless steel is the preferred style). Shaft length can vary, so a device with a long shaft is more practical for using with large pots. Handheld blenders are perfect for mixing powdered drinks, milkshakes, and smoothies – although it is necessary to hold the power button down to keep the blades turning.